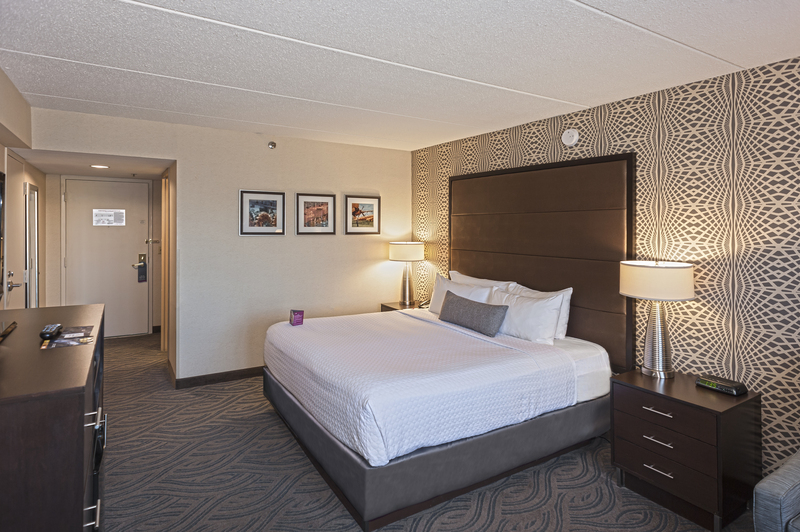 Elevate your travels with Crowne Plaza AiRE’s unique and upscale lodging near Minneapolis Airport. 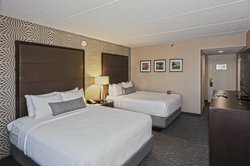 Boasting 430 well-appointed guest rooms and suites, our Bloomington, Minnesota accommodations are the perfect home away from home for business, leisure, and extended stay travelers. 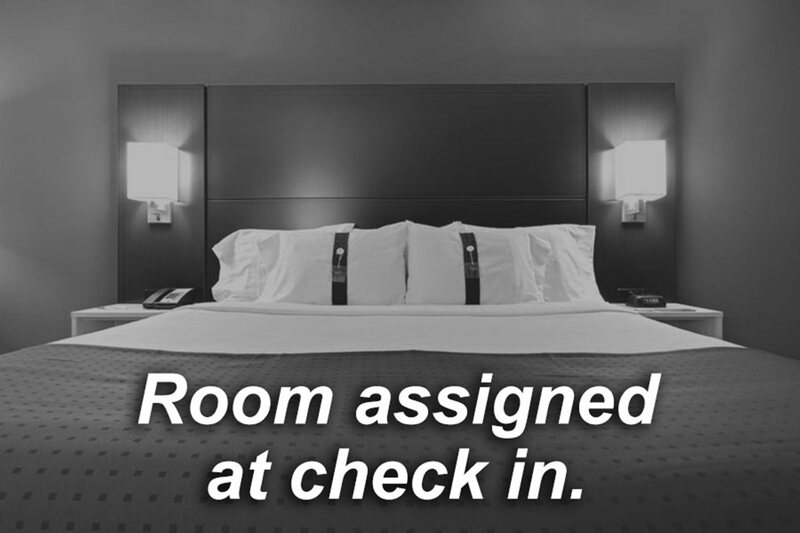 Choose the MSP Airport lodging that’s perfect for you! From standard guest rooms featuring all the thoughtful touches you need to rest easy, to our 120 spacious one bedroom suites perfect for families and group travel, we’ve tailored our accommodations to each of our guest’s needs. 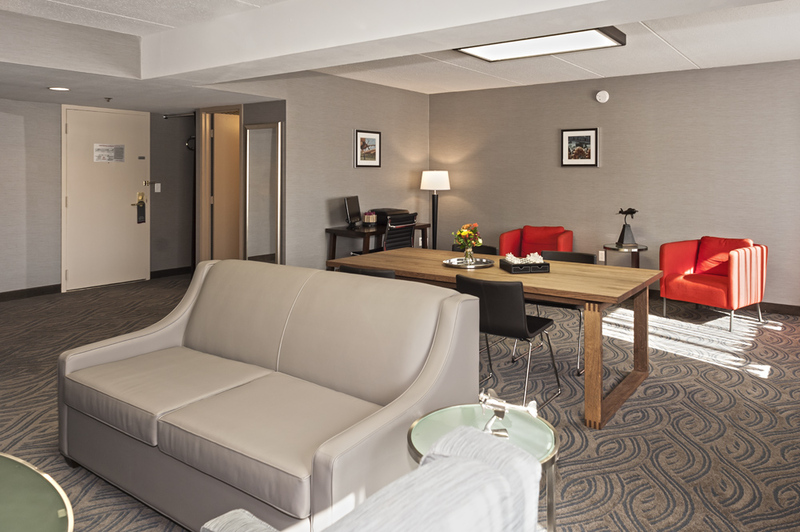 Enjoy thoughtful in-room amenities, including free Wi-Fi, 37” LCD HD flat screen TVs with over 50 cable channels, work desks with ergonomic chairs, coffee & tea makers, and much more. After a busy day of work or play in the Twin Cities, unwind with Templespa bath amenities and enjoy a wonderful night’s sleep in our plush king or double beds complete with complimentary Templespa Sleep Advantage Kit. 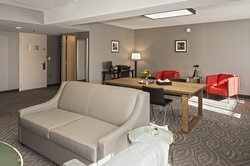 Upgrade your Minneapolis-Saint Paul lodging by booking our Concierge Level guest rooms or Executive Suites, or exclusive Presidential Suite. These upscale hotel rooms and suites feature all the added extras to complete your unforgettable trip to the Twin Cities. Our secure, key-card access Concierge floor features a private lounge serving continental breakfast and evening reception on weekdays. 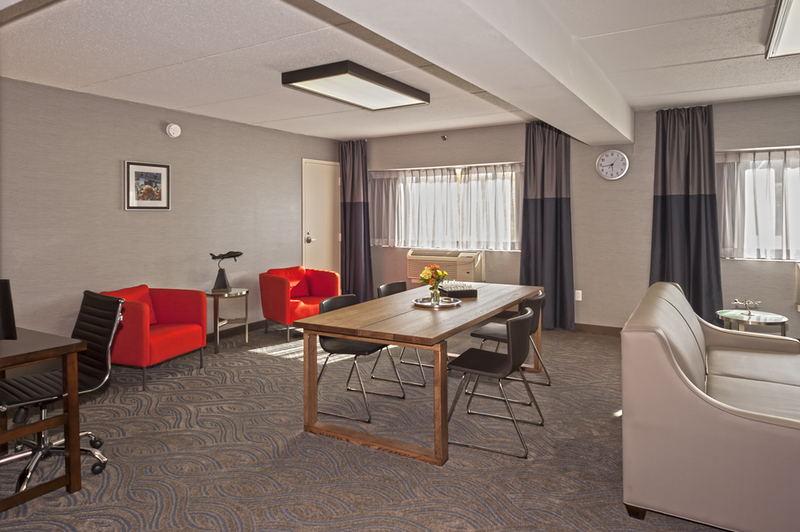 Business travelers will appreciate our Executive Suites, which are well-equipped with the amenities you need to host small board meetings and memorable gatherings for up to 30 people. And for the most memorable stay in the Bloomington area, our Presidential Suite offers all the space, luxury, and stunning views you need to celebrate your wedding day or special occasion. Crowne Plaza AiRE offers modern hotel amenities, special hotel deals, and unparalleled hospitality for all of our valued guests. 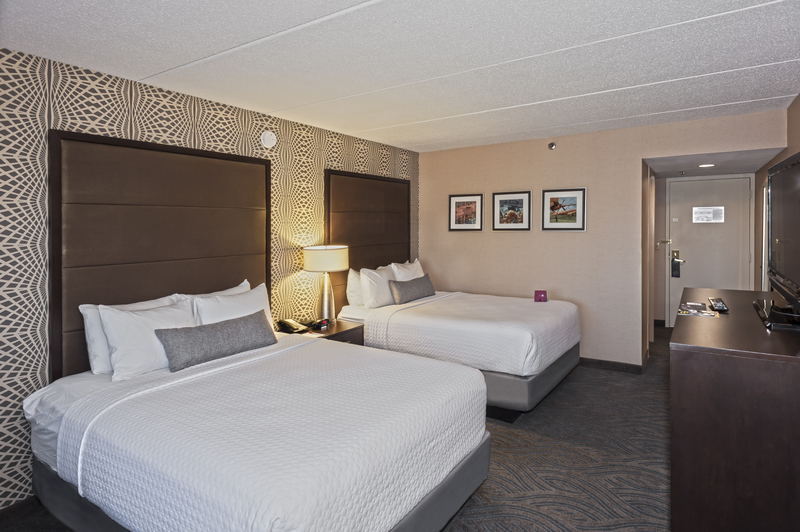 For only the best in comfort, convenience, and luxury, book your stay at our lodging near Minneapolis Airport today! Relax in our spacious King Leisure Room! Our guest rooms offer relaxing sleep amenities and pillow top mattresses. An ergonomically designed work station gives you task lighting. Enjoy free high speed internet access, a 37" flat panel television with over 50 HD channels, and a coffee maker, microwave and refrigerator. Take in beautiful views of the Twin Cities Skylines or the Minnesota Valley Wildlife Refuge and the Minnesota River. Guest baths feature granite countertops, make-up mirrors and Templespa Bath Products. Your home away from home in Bloomington. 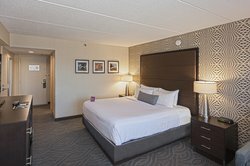 Boasting 430 well-appointed guest rooms and suites, our Bloomington, Minnesota accommodations are the perfect home away from home for business, leisure, and extended stay travelers. 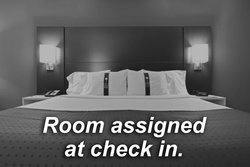 Choose the MSP Airport lodging that’s perfect for you! From standard guest rooms featuring all the thoughtful touches you need to rest easy, to our 120 spacious one bedroom suites perfect for families and group travel, we’ve tailored our accommodations to each of our guest’s needs. Bring the whole group along and book our spacious guest room with an added sofa sleeper! Our guest rooms offer relaxing sleep amenities and pillow top mattresses. An ergonomically designed work station gives you task lighting. Enjoy free high speed internet access, a 37" flat panel television with over 50 HD channels, and a coffee maker, microwave and refrigerator. Take in beautiful views of the Twin Cities Skylines or the Minnesota Valley Wildlife Refuge and the Minnesota River. Guest baths feature granite countertops, make-up mirrors and Templespa Bath Products. Modern luxuries at Crowne Plaza AiRE. Upgrade your Minneapolis-Saint Paul lodging by booking our Concierge Level guest rooms, Executive Suites, or exclusive Presidential Suite. These upscale hotel rooms and suites feature all the added extras to complete your unforgettable trip to the Twin Cities. Our secure, key-card access Concierge floor features a private lounge serving continental breakfast and evening reception on weekdays. Business travelers will appreciate our Executive Suites, which are well-equipped with the amenities you need to host small board meetings and memorable gatherings for up to 30 people. And for the most memorable stay in the Bloomington area, our Presidential Suite offers all the space, luxury, and stunning views you need for celebrating your wedding day or special occasion. Perfect for those looking for a bit of extra space, our 1 King Bed Oversized guest room with sofa bed lets you spread out. Our guest rooms offer relaxing sleep amenities and pillow top mattresses. An ergonomically designed work station gives you task lighting. Enjoy free high speed internet access, a 37" flat panel television with over 50 HD channels, and a coffee maker, microwave and refrigerator. Take in beautiful views of the Twin Cities Skylines or the Minnesota Valley Wildlife Refuge and the Minnesota River. Guest baths feature granite countertops, make-up mirrors and Templespa Bath Products. Experience an elevated stay at our Concierge Level floor. Our guest rooms and suites nestled on the key card accessible Concierge Level floor features private lounge access. Enjoy our weekday private breakfasts and evening receptions! Our King Executive Edition room is nestled on the key card accessible Concierge Level floor featuring private lounge access. Enjoy our weekday private breakfasts and evening receptions! 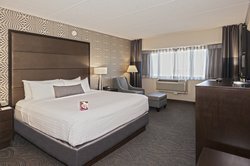 Our lodging near Minneapolis Airport offer relaxing sleep amenities and pillow top mattresses. An ergonomically designed work station gives you task lighting. Enjoy free high speed internet access, a 37" flat panel television with over 50 HD channels, and a coffee maker, microwave and refrigerator. Take in beautiful views of the Twin Cities Skylines or the Minnesota Valley Wildlife Refuge and the Minnesota River. Guest baths feature granite countertops, make-up mirrors and Templespa Bath Products. Our spacious 2 Double Bed room is perfect for the whole family! Our guest rooms offer relaxing sleep amenities and pillow top mattresses. An ergonomically designed work station gives you task lighting. Enjoy free high speed internet access, a 37" flat panel television with over 50 HD channels, and a coffee maker, microwave and refrigerator. Take in beautiful views of the Twin Cities Skylines or the Minnesota Valley Wildlife Refuge and the Minnesota River. Guest baths feature granite countertops, make-up mirrors and Templespa Bath Products. 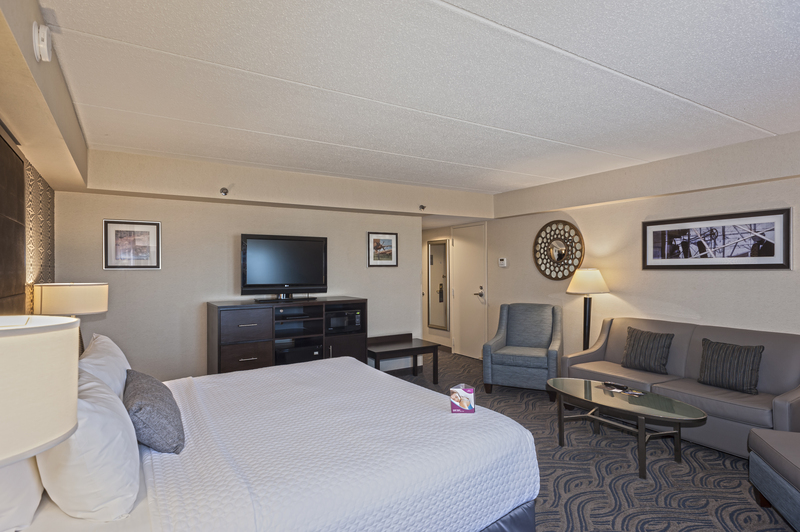 Stretch out in our spacious suites. Experience relaxation in your 413-square-foot suite. Relax in our pillow top mattresses, a plush duvet, luxurious sheets, and sleep advantage amenities. Each of our suites has a living room area with pullout sofa bed, refrigerator, microwave, 2 flat panel HD televisions with over 50 channels, wet bar area, and ergonomic work space. Enjoy free high speed wireless internet service, large armoire for storing luggage, and full length garments. Great for families or extended stays, our 120 suites give you the added living space for a relaxing stay. Our 2 Double Beds Concierge room is nestled on the key card accessible Concierge Level floor featuring private lounge access. Enjoy our weekday private breakfasts and evening receptions! Our guest rooms offer relaxing sleep amenities and pillow top mattresses. An ergonomically designed work station gives you task lighting. Enjoy free high speed internet access, a 37" flat panel television with over 50 HD channels, and a coffee maker, microwave and refrigerator. Take in beautiful views of the Twin Cities Skylines or the Minnesota Valley Wildlife Refuge and the Minnesota River. Guest baths feature granite countertops, make-up mirrors and Templespa Bath Products. Please note that bed type and smoking preference cannot be guaranteed as it will be allocated upon arrival based on availability. Our 2 Double Beds Suite features 413 square feet of spacious accommodations for your whole group! Relax in our pillow top mattresses, a plush duvet, luxurious sheets, and sleep advantage amenities. Each of our suites has a living room area with pullout sofa bed, refrigerator, microwave, 2 flat panel HD televisions with over 50 channels, wet bar area, and ergonomic work space. Enjoy free high speed wireless internet service, and a large armoire for storing luggage and full length garments. Great for families or extended stays, our 120 suites give you the added living space for a relaxing stay. Experience relaxation in your 413-square-foot suite. Relax in our pillow top mattresses, a plush duvet, luxurious sheets, and sleep advantage amenities. Each of our suites has a living room area with pullout sofa bed, refrigerator, microwave, 2 flat panel HD televisions with over 50 channels, wet bar area, and ergonomic work space. Enjoy free high speed wireless internet service, and a large armoire for storing luggage and full length garments. Great for families or extended stays, our 120 suites give you the added living space for a relaxing stay. Our 1 King Bed Suite Concierge room is nestled on the key card accessible Concierge Level floor featuring private lounge access. Enjoy our weekday private breakfasts and evening receptions! Relax in our pillow top mattresses, a plush duvet, luxurious sheets, and sleep advantage amenities. Each of our suites has a living room area with pullout sofa bed, refrigerator, microwave, 2 flat panel HD televisions with over 50 channels, wet bar area, and ergonomic work space. Enjoy free high speed wireless internet service, and a large armoire for storing luggage and full length garments. Great for families or extended stays, our 120 suites give you the added living space for a relaxing stay. Our 2 Double Beds Suite Concierge room is nestled on the key card accessible Concierge Level floor featuring private lounge access. Enjoy our weekday private breakfasts and evening receptions! Relax in our pillow top mattresses, a plush duvet, luxurious sheets, and sleep advantage amenities. Each of our suites has a living room area with pullout sofa bed, refrigerator, microwave, 2 flat panel HD televisions with over 50 channels, wet bar area, and ergonomic work space. Enjoy free high speed wireless internet service and a large armoire for storing luggage and full length garments. Great for families or extended stays, our 120 suites give you the added living space for a relaxing stay. Ease your tensions in our 1 King Bed Jacuzzi Suite lodging near Minneapolis Airport! Spend a night unwinding in your private Jacuzzi’s bubbling waters. Relax in our pillow top mattresses, a plush duvet, luxurious sheets, and sleep advantage amenities. Each of our suites has a living room area with pullout sofa bed, refrigerator, microwave, 2 flat panel HD televisions with over 50 channels, wet bar area, and ergonomic work space. Enjoy free high speed wireless internet service, and a large armoire for storing luggage and full length garments. Great for families or extended stays, our 120 suites give you the added living space for a relaxing stay. Our Executive Suites are perfect for the small board meeting with free high speed internet service and 37" flat panel televisions that are RGB compatible. Boasting a larger living room, these rooms feature 500-700 square feet of space and are the perfect place for your hospitality area for a gathering of up to 30 people. Refrigerators, microwaves and abundant counter space with sink and storage areas. To book an executive suite for your next meeting, contact the sales office at sales@crowneplazaaire.com.